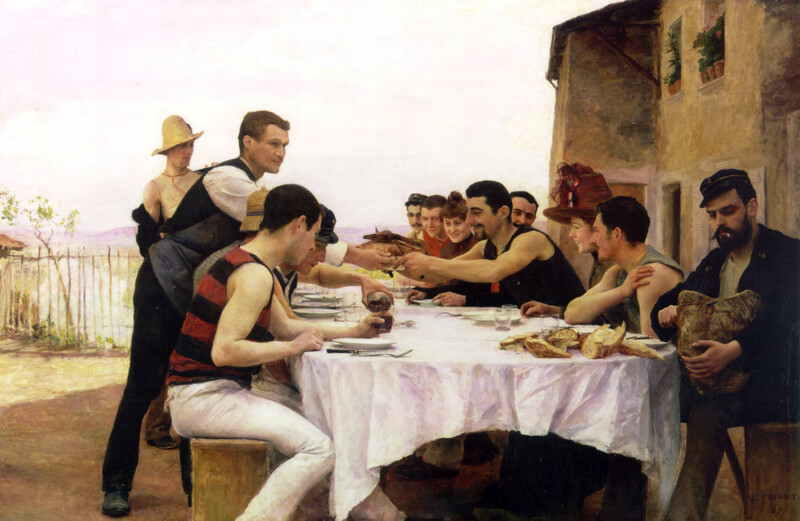 In Tajikistan I once talked with a spry and wiry old man at length about the importance of bread, its sacredness and importance in the history of human society, how disrespectful it is to let bread hit the floor. When I was making this, I was thinking of you, Aka-jan. This is the result of a few weeks of experimenting with my first sourdough starter. 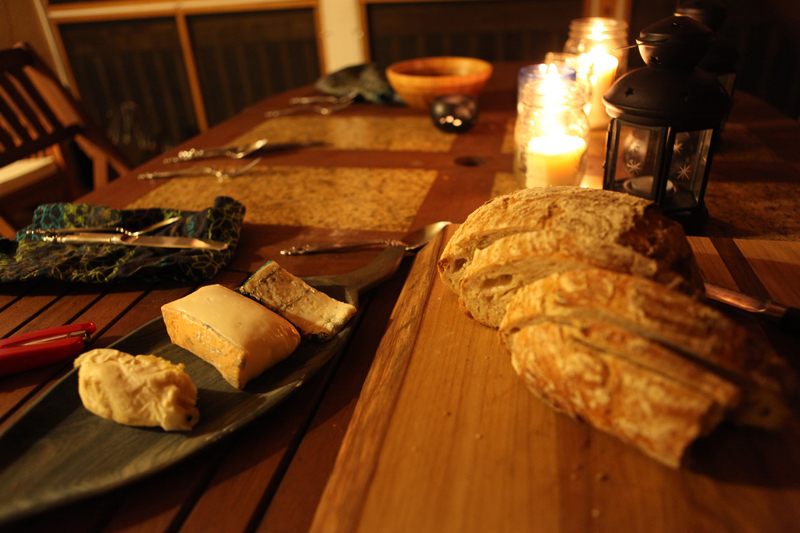 I followed the method set forth by Chad Robertson in his book Tartine. 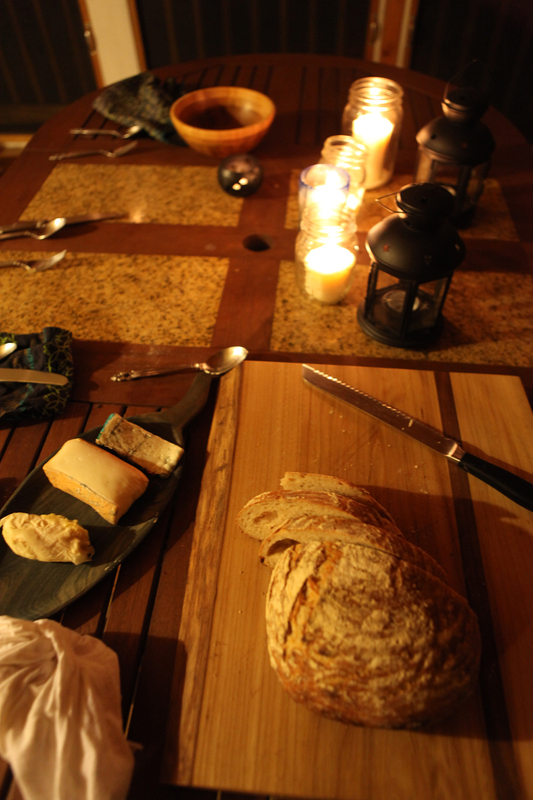 In my new house we have a second kitchen in the basement that I’m using for all kinds of these sorts of experiments: bread, cheese, beer, mushrooms etc. On baking day, you’re working on the dough all day. Only for about 30 seconds or a minute per hour, but you do have to be there all day to tend to various stages of the rise and fermentation of the dough. 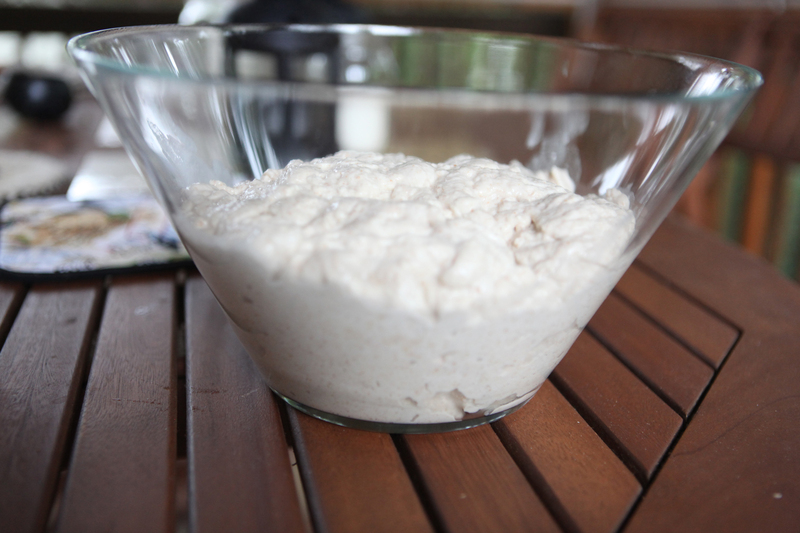 Once the dough has been thoroughly mixed and has rested for half an hour, it starts its first of two rise periods. For the first 3 or 4 hours of the rise, bulk fermentation, you have to periodically ‘turn’ the dough. 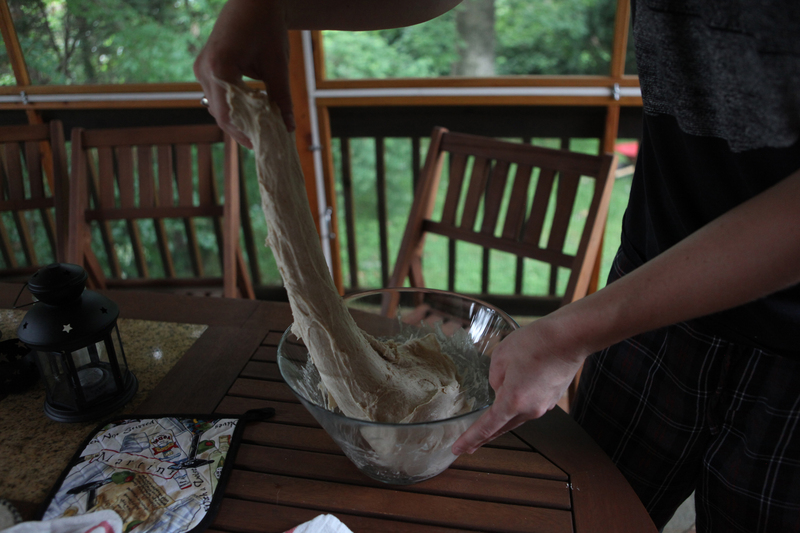 That involves digging your hand into the dough, pulling out one side, and then folding it down to trap gases inside the dough, and allow the gluten to be stretched and resettled. Then, for the second rise you split the dough into two (this recipe makes two loaves) and shape it. It rises in a proofing basket and then is turned upside down into a cast iron dutch oven that has been preheating inside a 500-degree oven. This allows steam to be trapped in with the dough to form a micro-climate that approximates a wood-fired stone oven. There is a craftsmanship at work in baking bread. The differences between good bread and ok bread are subtle, just as the differences between ok calligraphy and good calligraphy are subtle. But to the craftsman who is immersed within it, they are glaringly obvious. This bread was ok. My technique has not yet been perfected and still needs some experimentation. 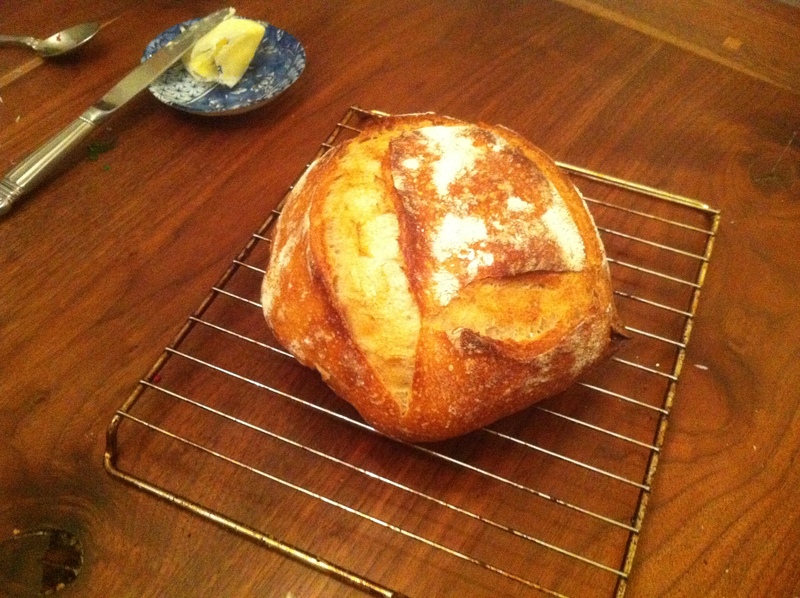 I also don’t feel like I am at the stage where I can say “Oh, x happened because of y. I need to adjust how I do that in future attempts.” Right now I’m still trying to understand the relationship between rise temperature, shaping technique, and baking time, and how they all come together to make a good loaf of bread. ~ by Josh on July 5, 2013.